The Judy House Cottages - Both 'Judy House' and 'Kim's Place' Cottages nestle privately in the ¼ acre property in front of the main house, providing you with the utmost seclusion while still feeling secure. You will feel comfortable and at home with all the modern amenities. The lush gardens that surround the cottages are truly stunning. You can glimpse the sea from parts of the back garden. 2 cottages, 2 beds each, 2/3 persons 2 pretty, clean, cosy, compact, self-catering cottages with screened windows and doors. Complete with ensuite hot water bathroom plus fully equipped kitchen or kitchenette. Shady verandah with table and chairs at the cottage front and private patio with table and benches at the back. With AC; fan; hairdryer; iron and safes. Free wifi, plus a computer monitor to connect to your phone. tablet or laptop with free Netflix Both cottages have shady veranda (porch) with table, chairs and hammock, plus private patio with table and benches. Two outdoor kitchens, one with barbeque; 2 outdoor bathrooms and lots of communal areas are also available to you. DOUBLE PRIVATE ROOM - 1 or 2 beds, 1 king or 2 twins 2 persons - with AC, hot water en-suite bathroom, private entrance, a beautiful fenced tropical garden. Designed for couples and friend’s that can afford a bit more comfort and privacy. A ceiling fan, hairdryer, iron, coffee maker, safe box all provided. Zoe’s private garden has a hammock, sun loungers, table and chairs. (Use of two outdoor kitchens, one with barbeque; 2 outdoor bathrooms and lots of communal areas are also available to you). At the back of the stunning Judy House property are 5 simple but cozy rooms designed specifically for backpackers - people of all ages that are travelling the World, the Caribbean or just Jamaica. BACKPACKER HOSTEL ROOMS - 10 beds, 10 persons) Mango, Papaya, Banana are 3 small single rooms. Rita and Micki are single rooms separate from the Hostel area. Guava and Jackfruit are one small 2-bed private dorm and one 3 bed mixed dorm. All hostel rooms are outfitted with a bed, mosquito net, fan, safe box, storage space, bed linens and towels on request. The Hammock Cabanas - (5 hammocks, 5 persons) available in high, dry season. 2 tented Cabanas, Passion Fruit has 3 single hammocks and Starfruit has 2 single hammocks. Hammocks come with a small mattress, pillow and mosquito net, with a secure shared luggage lock up, bench and shelves. Sleeping bag liner and blanket can be rented for a small returnable deposit. You are advised to bring a flashlight as the Cabana garden is lit communally but the Cabanas are not. My licensed ‘One 4 the Road’ Honesty Bar and Cafe’ is open 24/7’s where you can purchase beers, spirits, mixers, sodas, water, juices, tea, coffee, biscuits, chips, small food items to cook, lighters, rolling tobacco, papers and much more. In busy times freshly baked cakes and locals fruits are available to buy too. 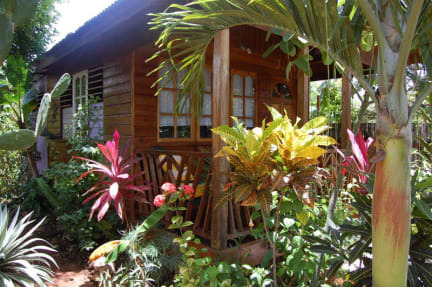 Country and Pretty - the Judy House Cottages & Rooms are located just a 10-minute walk from the Caribbean Sea up Westland Mountain Road, in Negril, Jamaica. It’s a great location, set in a friendly local ‘mixed’ community which gives you a very special taste of authentic Jamaican living. A few shops and small local bars are to be found in the neighbourhood before you reach the sea. On the local sea front, there are lots of local affordable places to eat, drink, hang out by the sea or chat with locals. The Backpacker Rooms and Cabanas have use of shared (and fully dedicated) outside bathrooms, fully equipped kitchens and wet weather gazebos. There is a dining area close to the main shared kitchen with outdoor food preparation and dishwashing space. There are sinks to do your own laundry or use the one site service provided by my 2 Housekeepers who you can pay directly to wash for you. Rooms and Cabanas overlook the beautiful rock and hammock gardens; Jamaican bushland; the moon and stars; plus the Caribbean Sea in the distance. There is a large terraced sun deck with roofed cabana: wifi; table; benches and chairs; sun loungers; outdoor baths and shower. 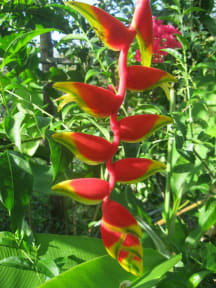 The Cottages have cable TV (with music channels too), wifi, hairdryer, iron, storage, safe-box, Jamaica made pictures and rugs to give you a real cosy, ‘home from home’ feeling to the cottages. Kitchens are fully equipped with everything you need to cook, juice fruits or just make coffee, tea etc. Just minutes from, restaurants, bars, shows, parties, supermarkets, gift shops, banks and of course Negril’s famous cliffs and 7 mile white sand beach are at your convenience. Everything is just a walk or a short local route or charter taxi away. Make the Judy House Cottages & Rooms your home away from home in Negril! This was a good place to stay in Negril. It's a 10-minute walk downhill to Town where at the corner is a coffee shop/ice cream shop, and also the canoe bar where they had beach access and good food and drinks. We rented bikes and were able to go to the seven-mile beach and ricks cafe in short time. The hostel had lots of places to hang out and had drinks and snacks for sale at the counter. Great staff, very helpful. Enjoyed our stay. Really nice place to stay in Negril. Good place and very nice staff! Amazing time! Met great people. Overall The Judy House is an amazing place. The owner Sue, as well as the entire staff, are great hosts, and the others staying were all kind, courteous, and a ton of fun! Looking forward to staying again. Oh, and Martel the security guard is extremely helpful and always makes you feel welcome. Chill hostel, good vibes, good people, fair price. Nice hostel. Very lovely rooms and helpful staff. Unfortunately there are a lot of mosquitoes, but I guess there pretty much everywhere. I enjoyed this experience most for the people I met. The garden and overall setup was nice. Relaxing and peaceful but can also be loud as people were hanging in the dining area and I was sleeping right next to it :/. I had earplugs and the fan helps reduce the noise but it should be better regulated for those that are sleeping around there. Also the showers didn’t really work. It was either a cold shower or a dribbling hot shower. Def can’t wash your hair well in it. The staff was wonderful! Not sure what I expected from hostels in Jamaica. While Judy’s is super affordable, the facilities need upgrading. The staff were very friendly though.